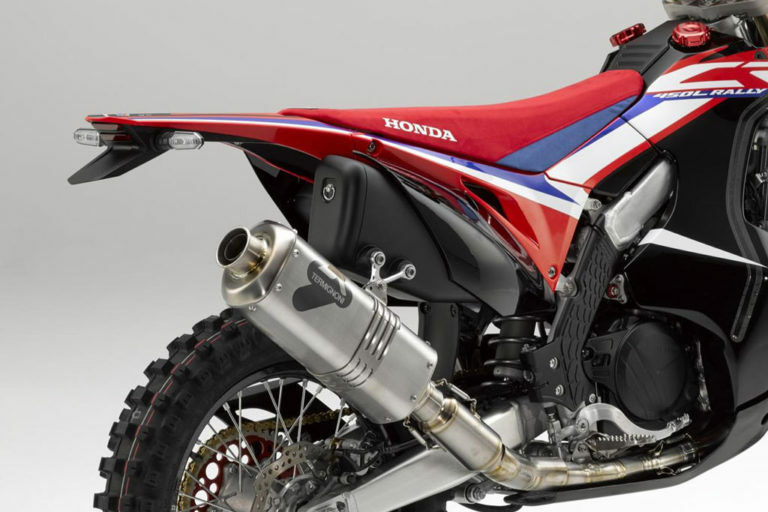  Honda R&D has produced a street-legal replica of their Dakar Rally Bike. Ever since Honda surprised us all with their announcement of the CRF450L earlier this year, rumors of a 450L Rally have swirled. At the CRF450L press launch last October, we asked Honda execs if they had plans for a Rally version, following in the pattern of the CRF250L Rally, but we received nothing but a grin and a “no comment” from them. 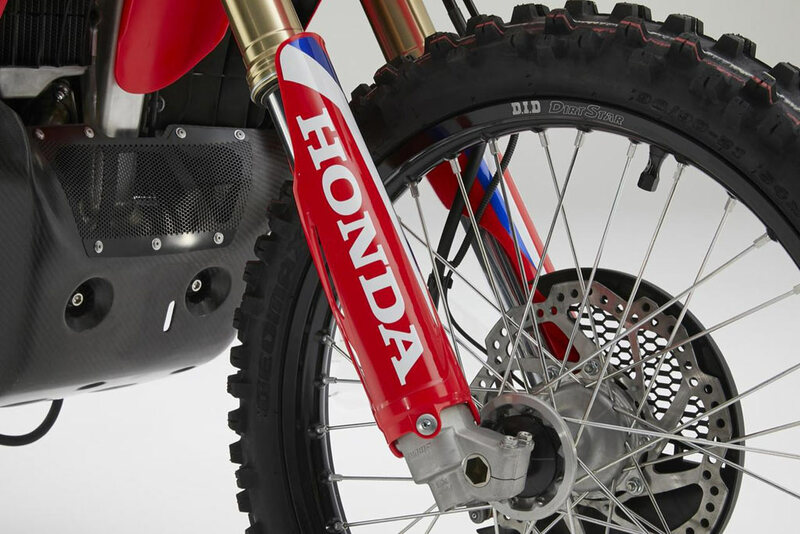 Now it looks like Honda has another sweet surprise for us coming from the EICMA show in Milan. Honda’s R&D has been hard at work cranking out concepts this year and this one might be the most exciting yet. Details are limited but Honda has put on display a CRF450L Rally concept. Basically, it’s a street-legal replica of their Dakar Rally race bike based on the CRF450L dual sport. The CRF450L Rally concept features dual front fuel tanks that extend low on the bike with a total capacity of 20L. At first glance, the CRF450L Rally Concept looks very similar to the ‘competition only’ CRF450 Rally Bike. It shares a clear windscreen, large navigation tower, low-slung rally exhaust by Termignoni, full-coverage carbon-fiber skid plate, Noguchi seat, dual front fuel tanks that extend low on the bike, and a matching HRC color scheme. Upon closer inspection though, you’ll notice there are a lot fewer billet aluminum bits, the bulbous rear number plates conceal a tool kit instead of rear fuel tanks, and the Rally Roadbook has been replaced with a TFT screen. 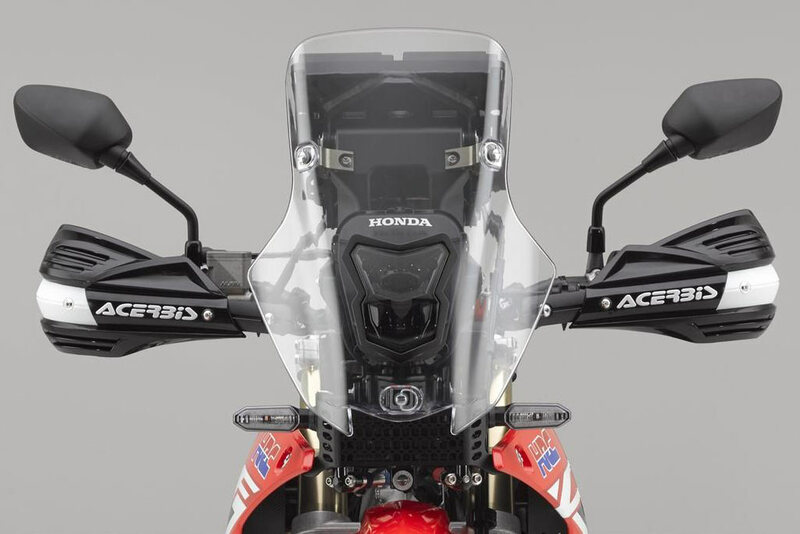 We can also see the navigation tower is plastic instead of carbon fiber and it appears to use the standard CRF450L headlight mounted inside the clear windscreen instead of the small bullet-style LED lights on the Rally Bike. 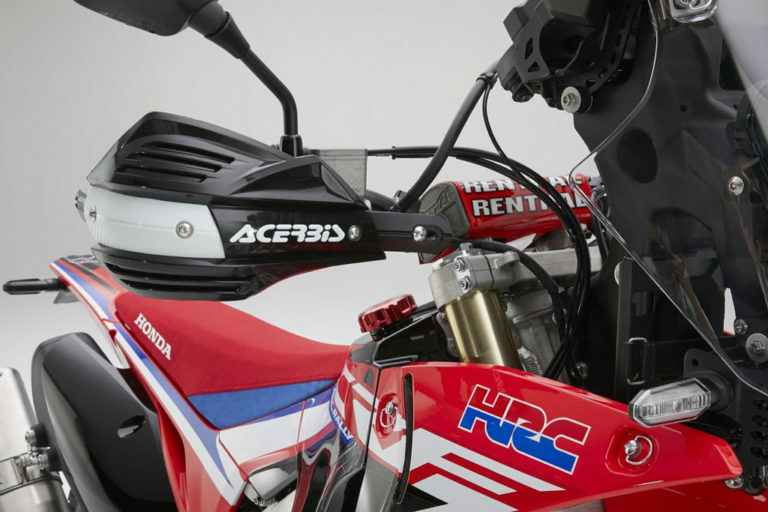 Honda seems to have made as few changes as possible to the standard CRF450L, keeping it basic, reusing the stock mirrors, turn signals, and tail light with a truncated license plate holder. It also looks like they are reusing the same chassis and single-cylinder 450cc engine (45+ hp) found in the current CRF450L. This could mean that Honda’s R&D department threw this concept together in a hurry for EICMA, or perhaps Honda is in a hurry to get this bike to market as quickly as possible. Honda isn’t known for rushing products to market though, so most likely we’ll see more refinements in this concept coming down the pipe. 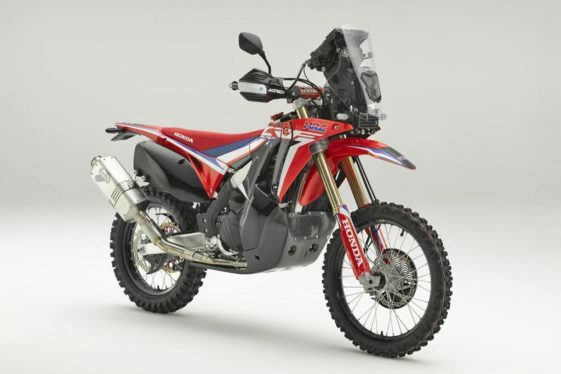 Currently, we have heard no plans to build a production version of the CRF450L Rally Concept but we expect Honda will test interest first to see if there is a strong market response. The CRF250L Rally also started out as a concept and thanks to overwhelming positive feedback, Honda eventually built the bike. We have a feeling the positive feedback is going to be overwhelming for this concept too! We’ll be following this one closely and will report back with more details as they come in. I’ve bought the 250 Rally last year and I love it. But for a 450 version I’d sell the 250 right on spot to get a little more grunt. Please Honda: Build it. Power ist not so important, but keep the reliability and the oil change intervalls high. grunt and long oil change intervals are counter to each other….you want reliability? it comes at the cost of performance. Oil change intervals are 600 miles on the 450L, that’s not gonna change. 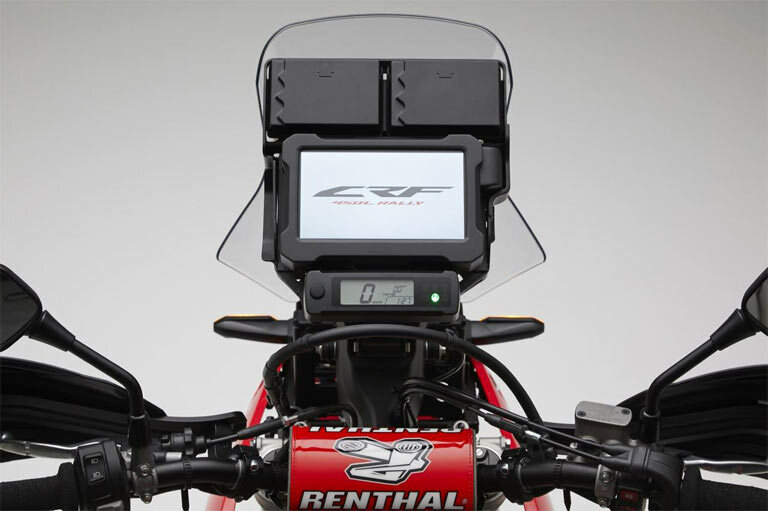 The base is the CRF450L, so it shares the same engine – and has the same problem: short service intervals. Even if I would stretch the oil change intervals by factor 2, the trip of almost 8000km I did this summer from Stockholm to Romania and back would have required at least three oil changes in those three weeks somewhere during the trip. So again not a bike for people who go out for long rides, but more for the weekend warriors. I know the KTM service intervals on the same displacement engine are similar. …and based on competition use. ‘Normal’ riding people have found you can go a lot farther than the recommended intervals. I AM that ‘weekend warrior’ that’s been drooling over a rallye bike since I figured out what they were. “Weekend warrior” was in no way meant negative, just to clarify. We all do have different riding preferences. Some folks are out for a day every weekend or so, doing extremely technical stuff (not my world and also not possible here in Scandinavia = illegal) but still might need to cover some miles to get there. For those this bike will be ideal. Sweet baby Jesus! Build it and I’ll give you the address to drop it off to! YES PLEASE!! it should have been a twin…. the aprilia 450 twin was a horrendous motor. Totally pointless to make a twin at such a small displacement….don’t see to many of those running now do you? Aprilia 450 rsv was imported in 2008…..and never again after that. aprilias design was first to compete in Dakar, but due to failing parts the first few year s, the company pulled the plug.. too bad.. later editions worked flawless.. But maintenance was crap.. parts expensive… But I love riding the bike! Please Honda, don’t jerk us around like Yamaha and its unicorn T7. Build it! EFI and longer service intervals please. Race bike like the KTM 450 Rally Replicas. Nothing to be excited about. You mean the NOT STREET LEGAL ones? While yes I would like to see rear aux tanks I can live with the service intervals even for cross country trips such as the TAT (trans-America-trail). At only 1.6l oil capacity I can easily carry the needed oil and an empty bottle to put the first dump in. so I say YES build it NOW before 2020 gets here and Yamaha takes my money for the 700 Tenere!! Is that an oil cooler behind the mesh grill underneath the headlight? If not it’s the perfect place for one and would go a long way on extending service intervals in this application. Please build it Honda!!! Just give it a little more oil capacity to extend that service interval! Put in an at least a 600cc twin engine, and call it TransAlp. That designation alone will make it reliable and service friendly. And it will the gap in the line-up. They could easily upgrade the CB500X to an XT version with proper off road size spoked wheels and upgraded suspension for that. And if they do not kill the XR650L there really is no gap to fill. 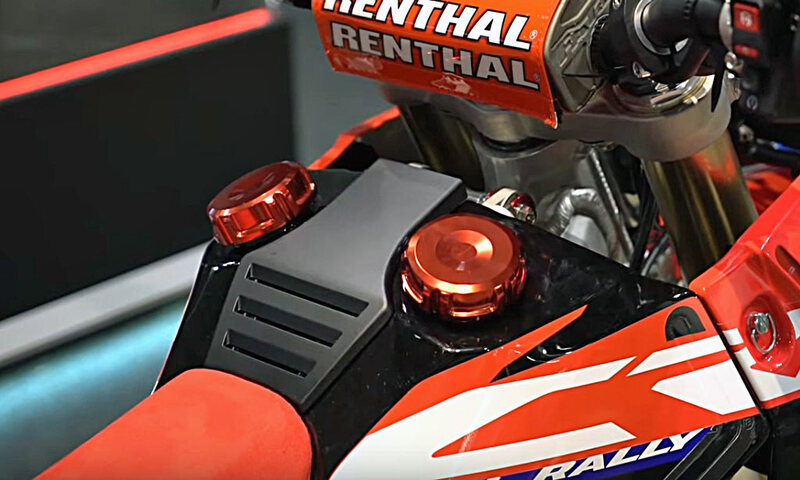 Head to head the CRF450L is far more closely in line with the KTM, Husky, GasGas and Beta offerings for a plated competitive off road bike than an ADV. Such a tease! What a great bike that would be. Honda, PLEASE be the one to change the adv game for the masses. sub 350 lbs, YES!!! If this bike will be built, it would cost between 19.000 – 23.700 US$ in Norway, according to the price tag (140.000 Norwegian kr) of the CRF450L here right now. It will probably also have only 25 hp to meet the Euro-4, and a 1000 km oil change interval. Still, I would buy it.. Please Honda, make this bike!